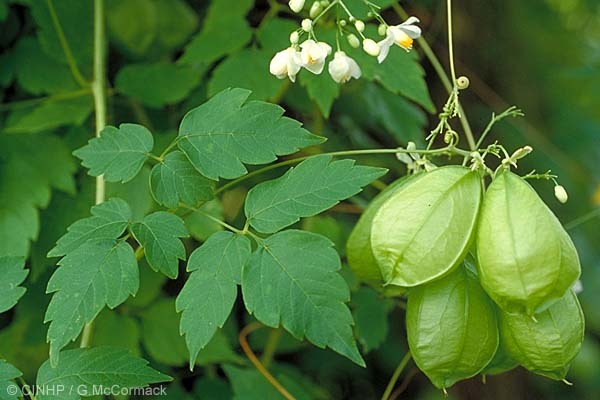 KEY FEATURES: A high-climbing, slender vine, to 10m. STEM ~5mmØ, rigid, ridged, hairy. LEAVES alternate, twice divided into 3 (=biternate); LEAFLETS 9, ovate to 8x6cm; dull green, edge with a few large teeth, base round, tip sharp. FLOWER STALK to 20cm with 2 subterminal tendrils, with or without flowers. FLOWERS ~12 in terminal cluster; small, ~15mmØ; sepals greenish, 2 large and 2 small; petals 4, white, to 9x6mm; nectary tube white with bright yellow tip. FRUIT (=CAPSULE) ovoid 3-angled papery "balloon" to 50x35mm(LxØ); SEEDS 3, round, 5mmØ, ripen black, each attached to the centre of a papery wing. NEGATIVE SIGNIFICANCE: Invasive - serious (Rarotonga - only), Weed - serious (Rarotonga - only). Comments: The most widespread high-climbing vine on Rarotonga, within the inland and increasingly on the lowlands. Fast growing and requiring a persistent effort to control it. Develops prolific amounts of winged-seeds and these are widely dispersed in the wind. A persistent effort is required to prevent it accidentally invading other islands. GENERAL NOTE: Native or exotic in Africa? Several African references list it as native possibly from tropical Africa southward to South Africa; while others list it as an invasive at least in South Africa, first appearing in Natal in 1937. Cardiospermum (literally "heart-seed") after the white heart-shape on the black seeds. Rarotonga: specimen, 1929, in Bishop Museum, Wilder with ID as Cardiospermum halicacabum, Avarua, 50ft elevation, "growing about the dwellings, not cultivated", BUT specimen is definitely Cardiospermum grandiflorum, G.McCormack 2003, and in Wilder's Flora it says "A cultivated ornamental. Not very common. Seen only in Avarua."